What tops my Christmas list, I hear you ask? Well, this year it's rucksacks, micro towels and sleeping bag liners... yes, Asia I'm coming for you! This is obviously out of the ordinary, however, and most years my Christmas list looks more like the above. What I love most? Cooking... and all things related! Christmas gift ideas for food lovers. One of the best presents I was bought last year was a subscription to Delicious Magazine. Twelve issues of mouth-watering recipes and gorgeous photography, it's super inspirational and the perfect Sunday afternoon read. On that note, I also love the idea of a curry subscription - three months of Friday night curry spices delivered to your door? Indian, Caribbean, Sri Lankan and Thai (to name a few) spices measured to fit a specially tailored recipe. Delish. Jamie always comes up trumps, right? I love his 30 and 15 Minute Meals books, and of course Comfort Food... what dreams are made of. His recipes are easy to follow and live up to expectation. I loved watching his Everyday Superfood series and the book would make a welcome addition to any bookshelf. Equipment. Tools. Gadgets. You can never have enough. Tell me I'm wrong! If, like me, you love blending spices to make curries from scratch (it's really not that difficult, I promise, and is so worth it) then a pestle and mortar is an essential. Marble, yes please. A cheese baker is another one of those things that seems unessential... until you want to bake your Camembert for maximum festive vibes and you aint got nothin'. We're already two baked cheese sessions into December. Want something a little more indulgent - this is the recipe for you. I love this wooden board from H&M (TK Maxx and Homesense also do a huge range), perfect for cheese and festive nibbles. Twenty-fifteen was the year I learnt to love coffee. And after trying coffee from one of these Bodum Coffee Makers I knew it had to be my next must-buy. Completely affordable (this one is only twenty quid) and retro beautiful, it's a winner. And finally, if you fancy making some edible Christmas gifts, I've got just the ticket. Try these scrumptious fudge-y, tiffin-y squares or these delish chocolate dipped honeycomb shards or these perfectly festive indulgent choccie brownies. Wrap in a greaseproof paper parcel tied with gold ribbon, and give the gift of food to those you love. 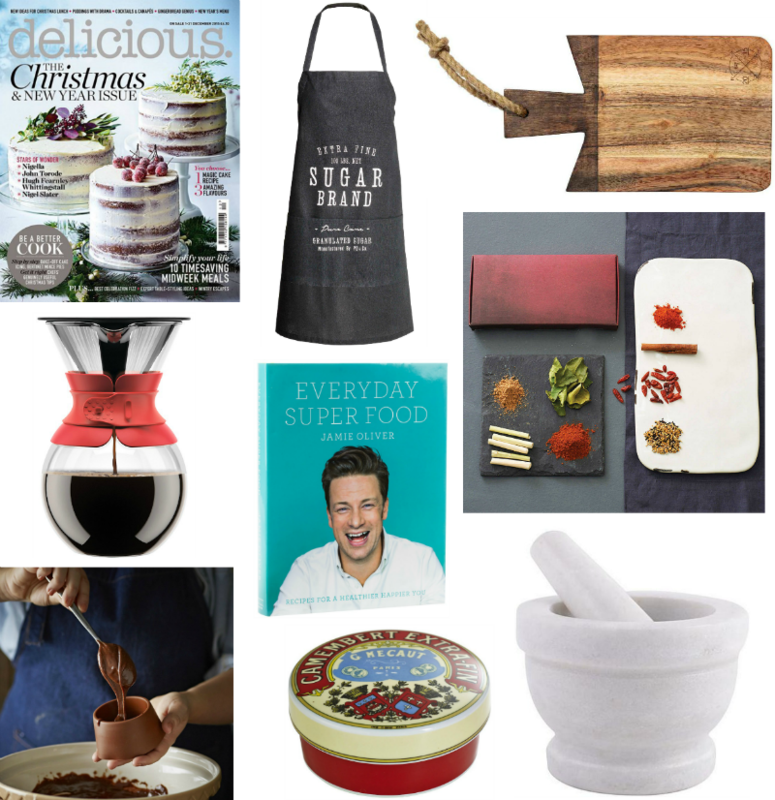 Delicious Magazine Subscripton, Bodum Coffee Maker, Jamie's Everyday Superfood, Friday Night Curry Subscription, H&M Apron, Lakeland Camembert Baker, Lakeland Fondant Kit, H&M Wooden Board, Dunelm Marble Pestle and Mortar. Curry subscription is such a good idea! A curry subscription sounds amazing!